Ronnie Chameau and Donna Pink are inviting the public to their Handmade Christmas Craft Sale on Saturday, November 5 from 9.00am to 4.00pm at Botanical Gardens’ “Little Cottage,” next to the Farmer’s Market. 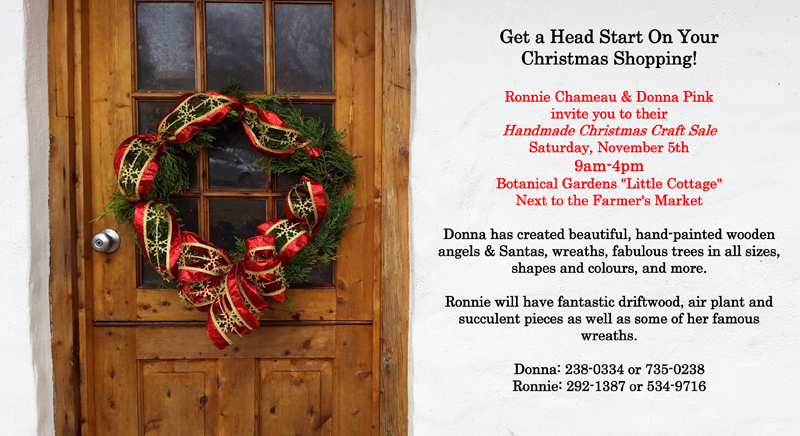 The event poster says, “Donna has created beautiful, hand-painted wooden angels & Santas, wreaths, fabulous trees in all sizes, shapes and colours, and more. For further information, contact Ms. Pink at 238-0334 or 735-0238 or Mr. Chameau at 292-1387 or 534-9716.